Before there was darkness or light or the universe itself, there was stillness. Beyond time, space, and form—beyond birth and death—it continues. And this is who you are in your most essential nature. With Touching the Eternal, join Eckhart Tolle on retreat in India to rediscover the universal destination charted by the worlds wisdom traditions: the possibility of awakening to the truths beyond words. Reminding us not to mistake the map for the territory, Eckhart shares here many of his hallmark pointers to presence. By surrendering to the present moment, we find that awakening is not something to be achieved in the futureit is within us right now. Illuminating common struggles of the spiritual seeker, Eckhart helps us release compulsive thinking, resistance to the now, addiction to suffering, and limiting spiritual beliefs. In the awakened state of consciousness, he explains, we can relate to both time and timelessness. We dont need more of anythingincluding timebecause we know that we are already complete. The eternal stillness that preceded the Big Bang exists within youits never gone away, explains Eckhart. Our task is to move from an absurdly limited sense of self into the spaciousness of the eternal Self. 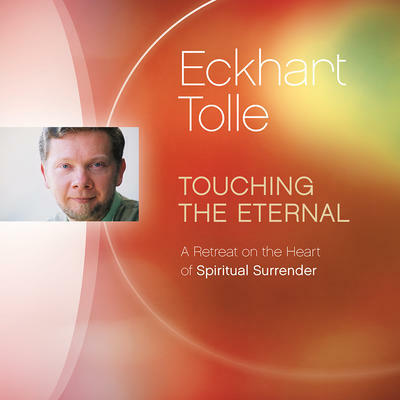 Touching the Eternal is a life-changing program to help you catch what Eckhart calls the evolutionary impulse, and realize the depths of freedom, wisdom, and peace that can be accessed within.